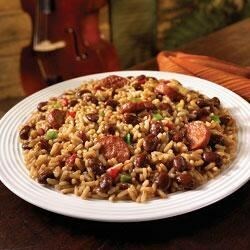 "Filling, flavorful and easy to make, this New Orleans-style dish is a Monday night tradition in Louisiana. And the addition of smoked turkey sausage makes it perfect as a delicious meal all by itself, or as a robust side." Heat oil in medium saucepan on medium-high heat. Add sausage; brown on both sides. Stir in Rice Mix and water. Bring to boil. Reduce heat to low; cover and simmer 20 to 25 minutes or until rice is tender, stirring occasionally. Remove from heat. Stir in green onions. Let stand 5 minutes before serving. Copyright © 2011, Zatarain's, All Rights Reserved. I added strips of onion at the beginning with the sausage, instead of green onion at end. Great recipe! Use Zatarain's Red Bean and Rice Mix. It's all in the mix and it's quick & tasty! This recipe is perfect for a quick, easy and inexpensive meal. Next time I would use 2 lbs of sausage, as my family likes more meat with their meal. Came out great, fried an onion with the sausage. Thanks for sharing! Quick, easy and inexpensive! Perfect combo! This turned out great and will fix again. I removed the Zataran's mix and replaced it with my own cajun spice mix and rice. Still turned out awesome.